Yesterday would have been my mother’s 66th birthday. She didn’t make it to her 55th though; she died of ovarian cancer. The tumor was the size of a grapefruit when it was discovered, three weeks before my college graduation. The doctors said that she probably wouldn’t live four months, but that was only because they didn’t (yet) know her strength. She fought through surgery, chemo, a stem cell bone marrow transplant, and more chemo. She battled cancer for three years before she eventually passed away. When she died it wasn’t the furniture or new cars my brothers and I argued over, it was the family photo albums. We each got a stack of albums, mostly filled with photos from the time period we most treasure. 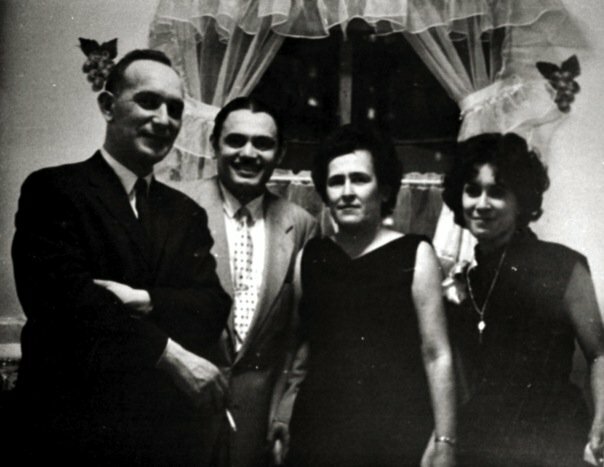 Certain photographs of ourselves with Mom and Dad, that “belonged” in a book claimed by another sibling were carefully peeled and relocated to one of our own books. I’ve moved across the country every few years – east, west, midwest, and south – hauling heavy boxes of albums and loose photographs with me; I did a lot of peeling/stealing from other albums. 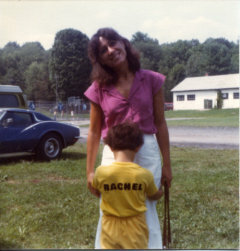 My favorite photograph, taken in 1979, shows me in my yellow Bronx zoo t-shirt, my back to my father, who was behind the camera. He was almost always behind the camera, shouting directives (I know now, that I get that skill from him.) This photograph shows me at age 5, my face burrowed into my mother. She hated to be photographed but always beamed on command for Dad’s snapshot. Her hair was bone straight naturally, but this was during her days of perm, looking like Carla from Cheers. She carried a 15 pound purse, always in her left hand. All you can see in this image are the straps, but I know what they held – lipstick, powder, wads of tissues, a small brown Coach change purse (with a $20 bill stashed inside for safety), safety pins, a baggie of snacks like cashews or carrots, a baggie with Tylenol, Sudafed, and anything else anyone might ever need. This is a classic family photograph – Mom’s big hair and big smile and me grumpy and frowning, hiding my face so that only Mom could see. 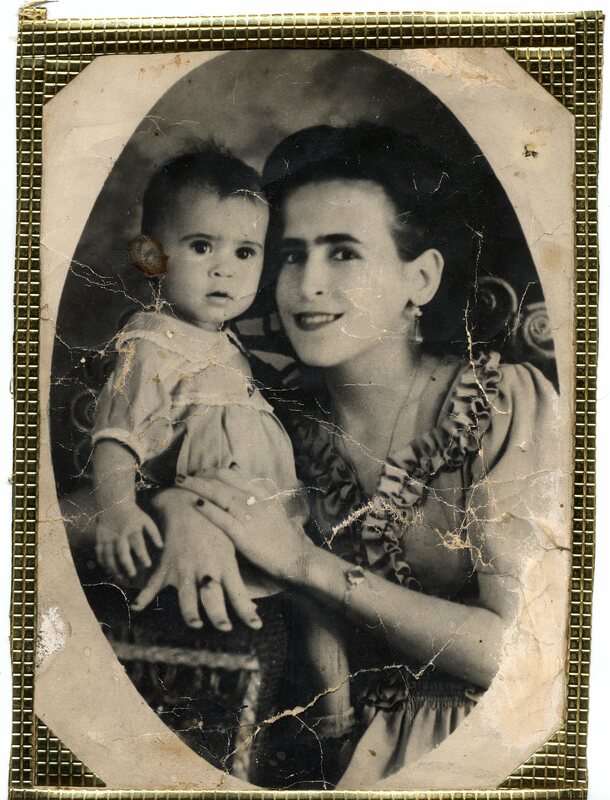 My other favorite photograph was taken in 1944, when my Mom was just a baby. My grandmother (who I think I most resemble), also had a beautiful smile and the dark eyes I inherited and passed down to my own children. I know that I have a baby picture of myself, hair sticking straight up, just like my Mom’s does here. She used to complain about the cowlick in front – it was always cause of untamed hair in the front. The tacky gold “frame” was a specialty of my abuelo. He loved loud, shiny things. I have photos of him wearing black and white striped NY versions of the zoot suite. He always wrapped the edges of photographs with this gold foil. I don’t remember my abuelo, he died when I was just two, so I all I have are whispers of what was, what could of been, and what should have been. My family hid tremendous family secrets; I know now that most families do. They are like ghosts that hover invisibly but are always present, whether or not you understand them. For years, I asked my mother (who was Puerto Rican and 19 years younger than my white, Jewish father) why she wore a wedding ring, and my father did not. She simply said, we don’t talk about those things in this house. I was always full of questions that always got that same answer. When I asked her how she met my Dad, she said simply, we don’t talk about those things in this house. When I asked her why she loved my Dad, she would stare silently and most often walk away. When I asked for help making a family tree for school, she’d only point to her few living relatives – her sister, brother, baby sister and my cousins, and would then swiftly move around, usually to go clean something. When I asked her about her wedding, she said even more quietly, we don’t talk about those things in this house. My father was also diagnosed with cancer, two weeks after my mother, and died two months before she did. After he died, my brothers and I rented a dumpster and started digging out 40 years worth of stuff from the basement. I found an old, yellowing white photo album and ran upstairs screaming, “look what I found!” When my Mom laid eyes on that photo album, she said simply, burn it! I hid the album, full of photographs of my parent’s “wedding,” it was more of just a reception. I learned later they got married at City Hall and had a “party” where these photos were taken. I ran upstairs, hid it, and didn’t bring it back out again until she died. My brothers, who are 9 and 11 years older than I, made a deal. They took this album to share with each other, but I wasn’t allowed to bring it home. I think that for most of my life they just saw me as a little girl, and in many ways still do. During one visit to my oldest brother’s house years ago, I filmed the album from cover to cover. 1 – Describe this image. Use adjectives, short words or phrases to describe the image. 2 – What do you see in this image? List the physical objects, use details. What’s in the background? Look closely at the image. 4 – What is the story of or behind this image? Who took the photograph? Where did you get it? Where do you keep it? Is it on display on the mantel or your night table, or do you keep it hidden away? Usually I just use my writing, revised into a one to two page voiceover narration as a demo (I like to model creative assignments for my students), and use this material to teach them to edit with final cut pro but, I never actually finish the digital stories. I edited a “rough cut” (a work-in-progress) this time, and some of the students cried. But still, I couldn’t finish it. But later in the summer, teaching 3 more sections of digital storytelling for the summer bridge to academic excellence program at the University of Minnesota, I did. I shared my finished digital story with my students, after they screened their final videos, as an act of reciprocity – it takes a lot to share your story in public space, particularly on a public blog. Sharing family stories, particularly the “secrets” and hidden histories, like I do in this video, are exposing. It hurts me to tell them. And I know that there are folks in my family that I love very much, who have expressed hate for me, specifically because of my truths (they disagree about the way my Mom feels about her marriage), and why and how I share these “lies. : But, I think that it hurts me more not to tell. I know my Mom would be proud. I think that my mother internalized and carried so much of her pain in silence and those repeated dismissals at my every question. I think that not talking about her truths, her life, her struggles, even to her own children was a weight she carried. I think that she died with most of her dreams unfulfilled. She repeatedly told me that she wanted to be a stewardess (that’s what they called flight attendants back in the back), so that she could travel and see the world. She did fight my father tooth and nail to go back to college and get a nursing degree. She loved being a nurse, helping folks, and thankfully she did get to go on a couple global trips, but not as a young, single woman. I think, honestly, that she got so sick and suffered so greatly because of the pain that she carried around inside. Pain can eat you from the inside out. Inspired by my mentor’s memoir ghostbox, and his courage to create his own digital story about his past, I’ve been (slowly) editing short videos, digital stories, to sort through these memories, my history, my pain and my truths. Here’s my first entry: ghostbox#1: killer cancer cells. I’ve realized that when it comes to the past, there is no truth. One person’s “fact” may have been a half-truth or straight lie told by one family member to another. The Truth is not the point. The point for me, is to know where I come from, to help navigate where I am and where I’m headed, and so that my own children won’t have to learn about my life from a box of old, yellowed photographs. If you are interested in the pedagogy of digital storytelling on the college classroom, check out this article and video. If you have the resources, study with me or take a digital storytelling workshop with Joe Lambert and the Center for Digital Storytelling. They do amazing work! Okay, I admit it. For the first time in a very long time, I was excited to watch BET! Did I just write that? Yes, BET aired a documentary about women in hip hop, and I am the happiest that I’ve ever been watching that channel. Women, and women of color, talking about their lives and experiences as rappers in the rap music industry. Talking, sharing, laughing. No booty shots. I cannot remember the last time that BET aired anything that appealed to me (though I’ve hit the top of their target demographic); there haven’t been any programs that I had to set the DVR for until now. As a woman of color, filmmaker, and a crunk feminist I have so rarely seen anything complicated, familiar, reflective, honest, or simply something that shows women talking, just talking and sharing stories. Let’s be real, how often do we get to look Black and Brown women in the eye on BET? I’ve been a firm believer that BET functions primarily as a cable space that says it wants to promote “blackness” and Black culture but usually airs limited programming – lots of commercial rap videos that articulate a very narrow view of hip hop culture, strict heteronormative codes of gender roles, and are often particularly troubling in their repetitiously programmed stereotypes of representations of race, class and gender. I believe that BET has done tremendous amounts of damage to hip hop culture and hip hop community, by promoting only limited and very specific representations of rap music, the larger cultural space, the elements beyond a b-boy as background dancer, and media messages that provide such a narrow box filled with stereotypes of all of the above. This is not by accident. This is a multi-billion dollar industry built on research of target markets, demographics, and funded heavily by advertisers who see viewers as only potential product buying consumers. Launched in 1980, cable network Black Entertainment Television (BET) has helped make blackness visible and profitable at levels never seen prior in the TV industry. In 2001, BET was sold by founder Robert L. Johnson, a former cable lobbyist, to media giant Viacom for 2.33 billion dollars. This book explores the legacy of BET: what the network has provided to the larger US television economy, and, more specifically, to its target African American demographic. The book examines whether the company has fulfilled its stated goals and implied obligation to African American communities. Has it changed the way African Americans see themselves and the way others see them? Does the financial success of the network–secured in large part via the proliferation of images deemed offensive and problematic by many black communities–come at the expense of its African American audience? So I tuned in to watch My Mic Sounds Nice: A Truth About Women in Hip Hop, which aired on BET, the firsts original music documentary that they will be airing, according to the press release. In the hour-long documentary (which, I feel was way too short! ), I felt like I was taken on a journey where I reminisced through bits and pieces of women in rap history and got to celebrate some of the legends like Roxanne Shante, MC Lyte, and Lauryn Hill. It wasn’t an exhaustive history and didn’t include interviews with some of the key ladies: Queen Latifah, Lil’ Kim, Foxy Brown, Lauryn, Da Brat, and so many others. I can imagine why some women didn’t want to be interviewed. Really, who wants to be asked about her sexuality in every interview, or wants to be confronted, questioned, or asked to be accountable for what they’ve said on records for a piece that BET my air over and over again in perpetuity? If I recall correctly (and please correct me if I am wrong), this is the first time that a Viacom outlet has granted the space for women to speak open and honestly about something besides aspiring to be a “video chick.” In fact, I was interviewed for the “documentary” about the video ho versus video model debate that featured Karrine Steffans and girls who aspire to be “models,” for a VH1 show. I was asked, “What is the difference between a video ho and a video model?” I replied, “the ho effs the rapper and the model effs the director.” I know it wasn’t a particularly nice, politically correct, polite, or even tv-friendly answer, but from my experience working on and around the music industry (on music videos, feature films, print magazines, record label biz, etc.) this has, unfortunately, been “the norm” of my experience. Obviously, my answer was not included in the program, but neither was any of the interviews with other smart, articulate, feminist/womanist women that they also interviewed. Only Karrine and the aspiring video girls got any face time (although we spent most of the program watching gyrating women’s bodies in strip clubs and on video sets, rather than looking at their faces). I have watched some of the “reality” programming on VH1, BET, and MTV (all Viacom owned outlets) that have also focused on “Superhead,” Salt N Pepa, Fantasia, Keyshia Cole and others, but have watched episode after episode that focuses on some super dramatic aspect of an artist’s life. So again my point is that cable outlets continually show us limited and limiting positions of/for girls and young women, as participants in hip hop culture. 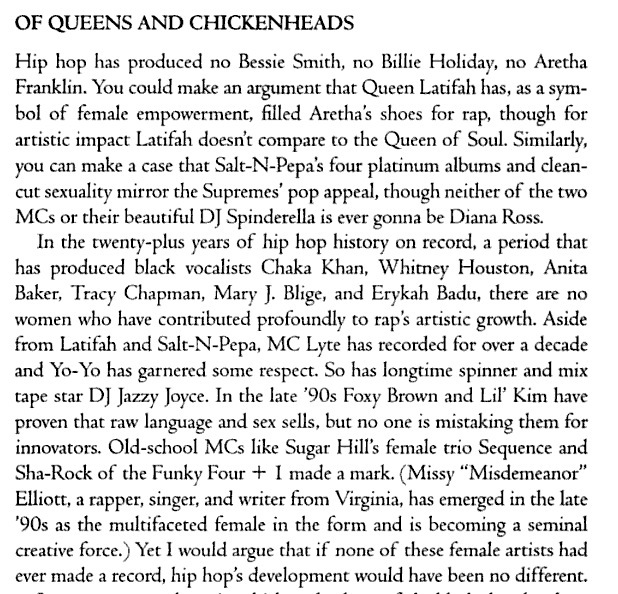 The portrayals show that if you have the right men around you, you can get produced as a girl group, or maybe be the “1 girl out the crew” like Rah Digga was of Flip Mode, Eve was of Ruff Ryders, Foxy of the Firm and so on, but it is likely that you’ll get dropped or won’t sell tons of records if and when your solo album is released. The story plays out that maybe, if she plays it all right (and follows the label/handlers calls), she will release a solo album and enter into the Foxy/Kim arena, or of course, she can be a featured dancer in the video, be an extra dancing in the club scene, or watch from home (as long as you are a record buying consumer). I’m not saying that there is anything wrong with any of these options, but what I am asking is why can’t women do more than be the plus one, or be more than fans who $upport, or be gyrating bodies without heads in the videos? So, back to the good news: I was gripped to the television and had my simultaneous facebook stream going watching My Mic Sounds Nice. 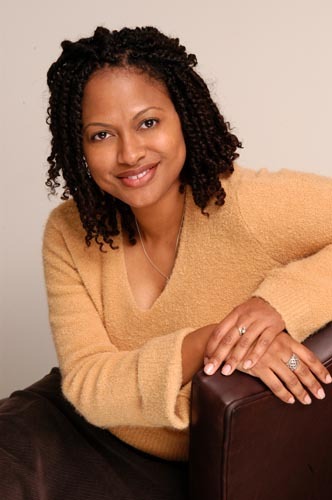 Mad props to the film’s director Ava Duvernay! So I have to say that I love the way Ava put this film together, aesthetically – the look, the visuals. She sits down to do intimate interviews with artists, journalists, and label folks, and allows us to look these sisters in the eye. Ava’s choice of close-ups for all of the interviews with the women rappers allows us to see most of them as we have never really seen them before – sitting, speaking clearly and articulately, and not intercut with images of them dancing, moving, grooving, or being hyper-sexualized (in terms of being portrayed as (hyper)feminine and (hyper) masculine in most music video representations). Looking at women who are beautifully lit, with light reflected in the eye, is a connective and very powerful experience for the viewer. The supporting cast of Joan Morgan and Kim Osorio, both key journalists, critical for their very different but both continuing to make important contributions, are framed in wider waist shots – they are important, but not (visually) at center stage. The men interviewed in the documentary, share their insights but aren’t given the space to talk over or over-talk the women. Quest Love (The Roots), Jazze Pha, Chuck D (Public Enemy), and others are also framed in eye-level waist shots that don’t give them any more visual power than the women rappers who are centered in the film. The framing, composition and lighting (soft, beautiful key light that brighten the eyes), allow us to be close, intimate, and connected, and isn’t that the point? It is important for me to address the major critiques of the film — yes the glam squad section where the women give reasons why more women aren’t signed or those who do get to put out records don’t consistently have sustaining careers, and the ol’ women are “too emotional” scenarios are included. I would argue that there is truth, and/or at least personal resonance with these factors by the artists themselves, otherwise so many would not have argued these points. Lots of ladies, men, and youtubers have interjected their critical commentary, interviewed Ava, and commented on facebook and twitter streams shouting praises, asking questions, noting absences, and just generally feeling like it was too much (Trina), not enough (tough/”real” questions), or just not thorough (missing key women and treating Lauryn like she’s died, since she left us after Unplugged). But this topic, for many us, the discussion of women’s careers on major labels in rap isn’t new, it’s just the first time we’ve actually seen our lives as diverse women in hip hop reflected on BET. My Mic Sounds Nice is not exhaustive by any means, but it is critically important to us nonetheless. And although it doesn’t interview as many women rappers as many of us would have liked to have seen and heard, the inclusion of Invincible, Eternia, Jean Grae, Tiye Phoenix, Medusa and other non-major label rap women in an ending montage, shows that Ava knows that at least she needs to give us a taste of what to seek out beyond BET. Overall, this film gives us beauty, insight, celebration, struggle, history, and puts us (as women who YES, Nelson George), have impacted rap music and hip hop culture. if none of these female artists had ever made a record, hip hop’s development would have been no different. I think that in a sentence George attempts to wipe out our contribution to the culture beyond tokenizing, marginalizing, and compartmentalizing, he just straight says that we haven’t had a real or significant impact on a culture that we have participated in as writers, rappers, artists, managers, publicists, filmmakers, supporters, journalists, photographers, b-girls, graf girls, and in every other capacity you could think of, since the beginning of hip hop. Yes, this passage gives us an easy target, but I think his point (while not always spoken), is a notion carried by many folks in and around hip hop culture. But, this simply is just not true. Battle rap would not be the same without Shante and UTFO, videos wouldn’t have inserted so much comedy without Missy and her black trash bag, Trina has brought agency to booty music, Lauryn has demonstrated that girls can write, sing, rap, play instruments, mother, and choose to participate or step away, and come back whenever she desires, and for anyone (particularly a writer, filmmaker, “historian,” and author documenting our generation) who attempts to discount, minimize, discredit, and ultimately try to erase our contributions is trying to (re)launch an attack that I won’t allow to happen. Please Check It While I Wreck It to get really deep, academic, and analytical on the impact that George and so many others have tried to have on women’s role in hip hop culture. I believe in the power of the media. I believe we should all roll with cameras in our purses. I believe that no one film will be the film about women in hip hop. So, no, we shouldn’t give all our praises to this one director and this one film, but shout, clap, and praise her and give it up to the many women (and men) who have been behind the camera lensing hip hop, and making incredible films, that will stand long past our generation. These films, documentaries, photographs, books, articles, blogs and such, are our visible evidence, proof that we came, we did, and we continue to do. Can’t stop, won’t stop! Say My Name, directed by Nirit Peled (2009). In a hip hop and R’n’B world dominated by men and noted for misogyny, the unstoppable female lyricists of Say My Name speak candidly about class, race, and gender in pursuing their passions as female emcees. This worldwide documentary takes viewers on vibrant tour of urban culture and musical movement, from hip hop’s birthplace in the Bronx, to grime on London’s Eastside and all points Philly, Detroit, Chicago, Atlanta, and L.A. in between. 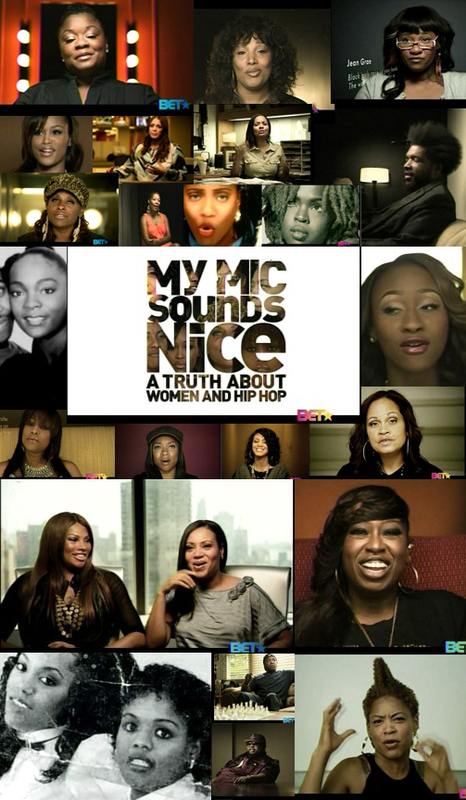 Featuring interviews and musical performances from a diverse cast of women including Remy Ma, Rah Digga, Jean Grae, Erykah Badu, Estelle and newcomers Chocolate Thai, Invincible and Miz Korona, this powerful documentary delves into the amazing personal stories of women balancing professional dreams with the stark realities of poor urban communities, race, sexism, and motherhood, as the more than 18 artists featured in Say My Name battle for a place in a society that creates few chances for women. From emerging artists filled with new creativity, to true pioneers like MC Lyte, Roxanne Shante, and Monie Love, these are women turning adversity into art. All The Ladies Say, Directed by Ana “Rokafella” Garcia (2009), is a film that highlights the lives of six iconic female street dancers from San Jose, Atlanta, Miami and Chicago, who have carved a niche in the physically challenging, male dominated breakdance world. Discussions about motherhood, sexual tension, femininity versus masculinity and the rap industry/mainstream images are a few of the themes explored by the documentary’s main characters. International dancers not only make appearances but also add their two cents about life as a B Girl in the hip hop world. The Revival (2009) is a tour documentary by rapper Invincible, that gives a candid glimpse into the first meeting of legendary Hip-Hop pioneer Roxanne Shante and veteran Philly emcee Bahamadia, as they trade stories of their struggles and triumphs in the industry over their long careers. It also shows the exchange of lessons between them and up-and-coming artists DJ Shortee, Eternia, Stacy Epps, and Invincible. This short documentary, a collage of performances and behind the scenes footage, was filmed and directed by Invincible while on the road in Europe as part of We-B Girlz all women in independent Hip-Hop tour. The largest all female Hip-Hop tour of its kind, it spanned over three weeks, six countries, and featured dozens of female artists who performed for tens of thousands of supporters. Scene Not Heard (2005), directed by Maori Karmael Holmes features interviews with some of the originators of hip hop such as Lady B, Schoolly D, Monie Love and Rennie Harris, with vanguards chiming in including Bahamadia and Ursula Rucker, and presents current talents such as the Jazzyfatnastees, Ms. Jade, and Lady Alma, and emerging talents such as Versus, Keen of Subliminal Orphans and Michele Byrd-McPhee of Montäzh, as well as scholars, critics and local promoters. Counting Headz (2007): South Africa’s Sistaz in Hip Hop, directed by Vusi Magubane, reveals the struggles and victories of South Africa’s women from the perspectives of three major performers in South Africa’s hip hop scene. MC Chi asks if there’s a contradiction of values between African and hip hop cultures, and if it’s possible to reconcile the two. Her questions thread together the obstacles encountered by fellow sistaz. DJ Sistamatic, challenged by a distorted media portrayal of her persona, candidly addresses the influence of male-formed images of women. World-renowned graffiti artist Smirk finds a way beyond her family’s initial misgivings about her art and prepares to merge a life with hip hop and motherhood. Nobody Knows My Name (1999), directed by Rachel Raimist (yes this is me), tells the story of women who are connected by their love for hip-hop music. Despite the fact that these talented female artists exist within a culture that revolves around self-expression, the subjects of Raimist’s documentary must struggle to be heard. Soundz of Spirit (2003), directed by Jocelyn Rose Lyons draws the connections between the creative freedom and the spiritual outlet that are provided by hip hop culture for the current generation. The documentary captures artists in their moments of inspiration and takes in-depth looks into their creative process, from conception to completion.Featured in Soundz of Spirit are KRS-1, Andre 3000 (Outkast),Common, Cee-Lo, Nappy Roots, Talib Kweli, Blackalicious, Jurassic 5, Dilated Peoples, The Last Poets, Aceyalone, DJ Q-Bert, Living Legends, Saul Williams, Shock G, Mystic, Zion I, Medusa, Michael Franti of Spearhead, Radioactive, Del, Davey D, Planet Asia, Goapele, Martin Luther, and many others. A feature film, Anne B. Real (2003), written and directed by Lisa France is a coming of age story of a young female rapper who finds her inspiration by reading the Diary of Anne Frank. Miss M.C. 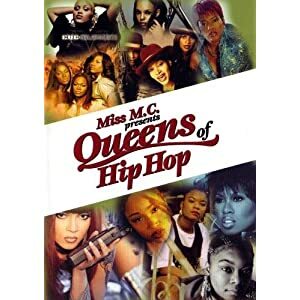 presents Queens of Hip Hop (2003), directed by Danila Perkins, claims that although the rap scene has been ruled by men for 20 years, this documentary show how and which women are making big moves in the industry with interviews with Salt “N” Pepa, Lady Luck, Rah Digga and Charlie Baltimore. Estilo Hip Hop, directed by Loira Limbal aka DJ Laylo and Vee Bravo (2009), is a feature length documentary that chronicles the lives of three hip hop enthusiasts from Brazil, Chile, and Cuba who firmly believe that hip hop can change the world. As we delve into the lives of Eli Efi, Guerrillero Okulto, and Magia, we learn of three inspirational leaders responsible for mobilizing young people to become politically active. However, the personal issues affecting the three protagonists prove to be as overwhelming as the challenges posed by their political work. As the stakes assume a greater risk, Eli Efi, Guerrillero, and Magia make life-altering decisions that ultimately impact the course of their lives and that of the hip hop movement. & a newbie on the scene (but one that I expect great things from) is media maker/photographer Rebecca “Bfresh” McDonald who is doing a short doc series on Minneapolis changemakers for Intermedia Arts.